Friends! They’re here! My new cookie crush. Imagine this: a perfectly baked, tender cookie studded with dark chocolate (or dried fruit!) that’s naturally sweetened, vegan, gluten-free, and grain-free! Plus, it’s made with 10 wholesome ingredients you probably have on hand right now. Let’s bake! 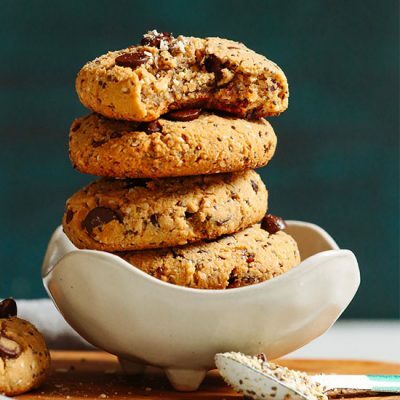 The base of this cookie is inspired and adapted from my Best Almond Meal Chocolate Chip Cookies. Aquafaba provides moisture and binding (acting as our egg substitute), almond flour and shredded coconut replace traditional flours, and coconut oil replaces butter. To keep things naturally sweetened, we went with coconut sugar and a little maple syrup. 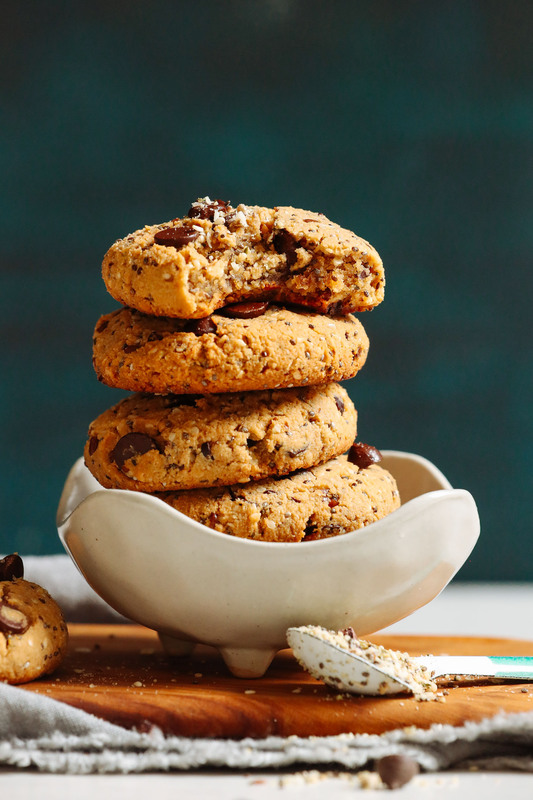 To keep these entirely refined sugar-free, be sure to use a bittersweet dark chocolate chip (or unsweetened dried fruit!). The star of the show is seeds! I used this lovely Superfood Burcha mix, which includes tasty things like pumpkin, flax, sesame, sunflower, and cacao nibs. But you can really use any combination of seeds you want! 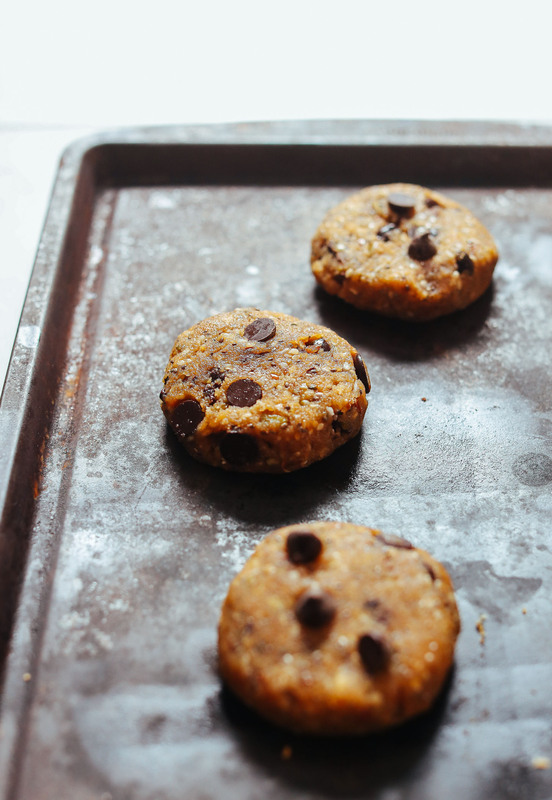 The result is a cookie with lots of fiber, healthy fats, protein, and a subtle crunch. & Healthier than your average cookie! These would make the perfect healthier dessert to have on hand throughout the week. Store in a cookie jar (because fun) or in the freezer to keep them fresh even longer! I could see making these in larger batches and tucking them away in the freezer for future snack attacks. Also, these would make the ideal trail, camping, or road trip treat! So many options. 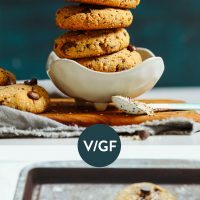 For healthier cookie recipes, check out our 5-Ingredient Vegan Gluten-Free Cookies, 3-Ingredient No Bake Peanut Butter Cookies, Healthy Chocolate Chip Oatmeal Cookies, and Fudgy Vegan Brownie Cookies! 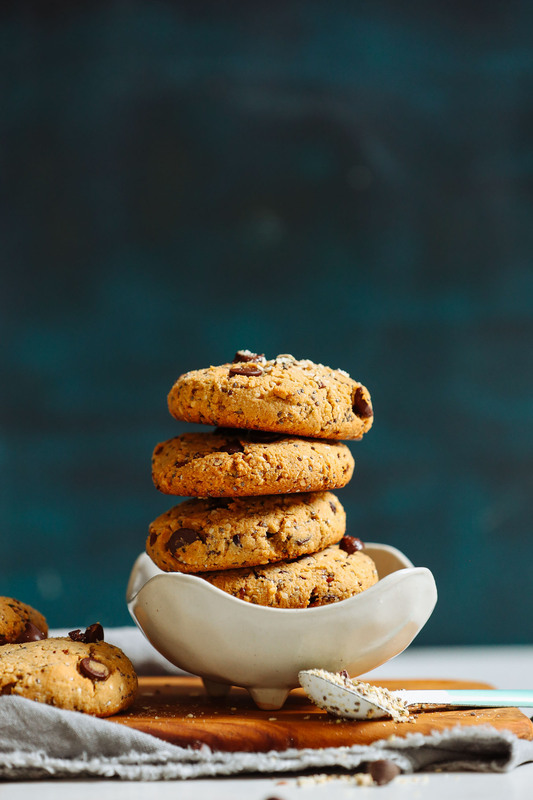 Vegan, gluten-free trail mix cookies made with 10 wholesome ingredients and simple methods. A delicious, tender, chewy snack or dessert! 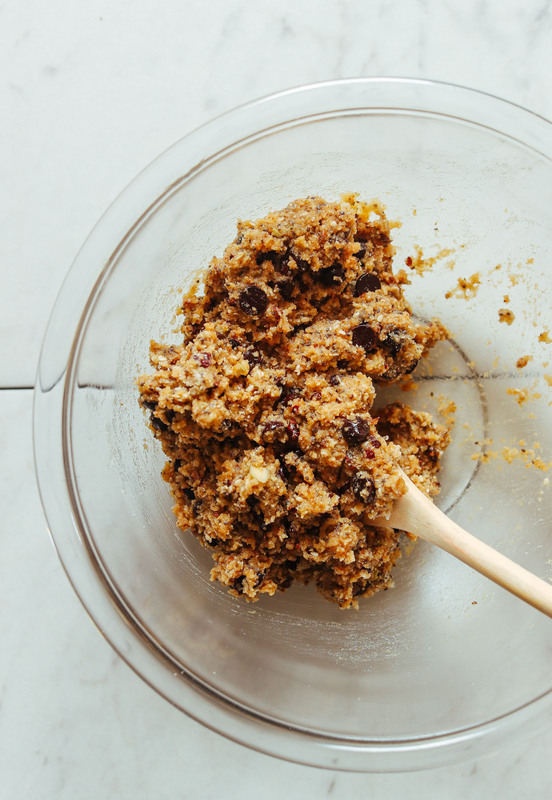 In a large mixing bowl, stir together almond flour, dark chocolate chips, seeds, coconut, baking powder, salt, and coconut sugar. To the aquafaba, add the melted coconut oil, vanilla (optional), and maple syrup and beat or whisk to combine (aquafaba will deflate a little - that’s normal). Then add to dry ingredients and mix until just combined. You should have a firm, semi-tacky dough (see photo). If too wet, add a bit more coconut or almond flour. Loosely cover and chill in the refrigerator for at least 30 minutes or overnight. Preheat oven to 350 degrees F (176 C). Scoop out 3-Tablespoon amounts of dough (I used this scoop, scooped out two balls, and then formed them together) and form into balls. Then slightly press them down into discs (see photo). Top with a few more chocolate chips if desired. Place on a bare or parchment-lined baking sheet with about a 1-inch gap in between each cookie to allow for a little spreading. Bake for 20-25 minutes or until the undersides are golden brown and the tops appear slightly puffy and cracked. Remove from oven and let cool on the pan for 10 minutes. Then carefully loosen with a spatula - they can stick a little to the bare pan. Enjoy immediately or let cool completely before storing leftovers in a sealed container at room temperature up to 4 days, 1 week in the refrigerator, or 1 month in the freezer. *To keep these entirely refined sugar-free, be sure to use a bittersweet dark chocolate chip (or unsweetened dried fruit!). *The seed mixture I used is the Superfood Burcha from Feel the Lean. Feel free to mix and match any of these seeds. If using large seeds (like pumpkin or sunflower seeds), give them a blitz in a blender or food processor or chop finely with a knife before using. *Nutrition information is a rough estimate calculated with 1 Tbsp of each type of seed listed and without optional vanilla. If I wanted to use eggs, any idea on what the conversion would be? Absolutely love your site and recipes – they are always fab! Hi Hannah, we haven’t tried it, but think 1 egg should work! Let us know if you give it a try! I make these every week and they’re great! Also good for adding fibre to your diet. I’ve tweaked the recipe a bit as I’m not GF, I use wholemeal flour (or sometimes mix of wholemeal and spelt), add ground flax seed, chia seeds and sunflower seeds. I up the aquafaba to 1/3 cup to accommodate for the flour switch. Oh I love this recipe! I had to mod it to fit what I had on hand ..
this is a delicious recipe base and lots of room to play with the ingredients so thanks for sharing! These were amazing!! Crunchy on the outside but still chewy, sweet but not too sweet, YUM!! Thank you for this delicious recipe. I’ve been making more and more of your recipes lately. They’ve all been a hit but this one is especially delicious!! Omg I made these and I’m so obsessed! I added flax seeds, sesame seeds, cacao nibs, and cashew pieces! Love love love!!!! Delicious! Because of what I had on hand, I substituted oats for desiccated coconut, hemp for the seed mix, and 2 chia eggs for the aquafaba. I made smaller, 1 T sized “patties,” and they browned nicely underneath and held together. I love your recipes, and I appreciate that you work so hard to get it just right. The only change I made was not leaving them 10 minutes on the pan — really? Hot cookies out of the oven!? We’re not waiting 10 minutes 😆. These are incredible. The texture and flavor are perfection. Unfortunately I didn’t have coconut sugar on hand so I used dark brown sugar, but I am going to try them again with the coconut sugar. They’re so soft and chewy, and bake up about an inch high. I used ground flaxseed meal for the seeds. Will be making these again and again, thank you Dana! Great recipe! I did modify by cutting the coconut sugar to 1/4 cup and omitting the maple syrup. For the seeds, I used half ground flax and half sprouted pumpkin seeds. I also made the smaller cookies and baked them for around 12 minutes. Next time, I think I’ll just use a 1/4 cup of organic cane sugar. This is just personal preference, but I just don’t care for coconut sugar. I also think dried cranberries would be an awesome add. How much applesauce would you use to replace the oil? Typically it is a 1:1 ratio, so use the same amount of oil that it calls for! I just made these and they are super easy to make and delicious!! I used ground flaxseeds and made the cookies a bit smaller using a tablespoon. This was my first time using aquafaba and it was surprisingly easy to whisk and use in the batter. Thank you for your helpful tips! These are hands down the best vegan cookies I have ever made! A huge hit with everyone (all non-vegans!). Vegan GF at that! Just so impressed! I used Golden Raisins instead of Chocolate Chips because I wanted a breakfast cookie. I added all the recommended seeds and in fact doubled the recommended quantity. I only used 1 T of Coconut Sugar. My finiky Vegan Frank said they are the best cookies I have ever made ; ) Thank You, Dana. . .
Yay! We are so glad you enjoyed them! I’ve recently had to go dairy and egg free and am just starting to dabble in vegan baking techniques. This aquafaba technique blew my mind!! And the cookies turned out perfect! Chewy and delicious. I made these nut free, subbing a mix of oats and amaranth ground into a coarse flour in place of the almond meal. They turned out great (albeit not grain-free). This was my first go with aquafaba as a binder – what a revelation! Thanks for developing brave recipes that hold up to all of our wild modifications! I used these substitutions, and the cookies were delicious – even the omni-eaters loved them. I was super happy with how easily the dough could be formed as you drop onto the cookie tray – other similar recipes leave too much of the dough sticking to my hands, so I was thankful that this recipe was less sticky. Perhaps the fridge time helped in that regard. Thanks for the recipe! Just wondering if anyone has tried this and added chia seeds in with their seed mixture (or if you think that would work, Dana). Just want to be sure it won’t interact with anything and become jelly-like. Hmm, they may expand. If you try it let us know how it goes! think it would work doubled straight up or should I modify some of the proportions? Okay, I’ve made these twice now – they are seriously delicious. I love the texture as well as the taste. Plus they are super easy to make. Thank you so much for another great recipe! Yay! Thanks for sharing, Shanon! I really loved these and will make them frequently. I used pumpkin seeds and flax seeds, which I blended briefly in a dry vitamix to break into smaller bits, as well as sesame and hemp seeds. I didn’t have vegan chocolate so I added raw cacao nibs instead and I loved the crunch. I had never used aquafaba before in baking (I do use it to thin my hummus) and I was worried that the cookies would taste like chickpeas, but there were perfect! Thanks for sharing your recipe changes, Sara! Could you please consider starting a company like Home Chef, Purple Carrot, Sunbasket etc. using your receipes and organic ingredients? I know this is very little to ask of you (insert smiley face here)! I love your receipes!! Thank you and I’m not really kidding about my request – think about it!! You’re so kind, Janet! While it isn’t a plan at this time, we appreciate the suggestion! These cookies are fabulous. Made them as directed with hemp and sesame seeds. I don’t use the mixer much so it did necessitate a trip to the garage to carry it in…but these cookies are so worth it (and the extra steps helped burn a few calories, enabling me to eat more cookies!). Moist and flavorful, with some added interest and nutrition from the seeds. Another great use for aquafaba! We are glad to hear you enjoyed these cookies, Ellen! These cookies are to die for. The best cookies I have made so far, absolutely delicious. Thank you for the recipe. Yay! Glad to hear it, Olga! Great recipe. I had to make a few changes due to availability of ingredients in my pantry. I used steel cut oats instead of coconut; I used an egg instead of aquafaba; my seed mix was sesame, pumpkin, and sunflower; I used cacao nibs and dried cranberries. I used a 2 tbsp scoop and made 15 cookies. My husband ate a few and then hid another 5, because my intent was to take the cookies to work and he didn’t want to miss out. I only ended up with 7 to take this morning! Everyone loved them. I’m making more tonight, with coconut this time. Really great cookies, everybody in the familly loved them. We are so glad to hear that, Marc! 2nd time lucky for me and these cookies. They come out of the over super-soft. The first time I made them, I put them back in and took them too far (still delicious though). On this second attempt, I cooked them for 20 mins and whipped them out of the oven when they were lightly golden. The cranberries and dark choc combination is awesome. I used a mix of ground flax, hemp and sesame seeds this time and they worked well. The ground flax helped to bind, too. Lovely! thanks for sharing, Keira! Anyway is there any reason that I can’t substitute the dark chocolate chips for carob chips? And is there a carob chip you recommend? Thanks! That should work! Have never used them so don’t have any recommendations, sorry! Is there any way I can use less coconut sugar in this recipe? I’m not a big fan of baking that’s too sweet. I’m always worried when it comes to making new vegan desserts. I’m not a vegan but my sister and her husband are and when they come to visit I try to have some options made for them. They loved these cookies and so did I. Thank you for posting this. This was my first use of aquafaba in baking and my first gluten free cookie. I followed the recipe pretty much as is…used hemp, pumpkin, flax, and sunflower seeds (larger seeds chopped up a bit). My batter was quite runny; however, I do live in an extremely humid climate, so next time I will decrease the liquid a bit before baking. I ended up adding about 1 cup of additional almond flour, chilled for an hour, and then baked for 20 minutes. They turned out perfect! I shared them with all non-vegans and they were much loved. Thank you for the ‘minimal’ recipes. You are my go-to blog. Whoop! Glad to hear it, Milda! I used 1/4 c honey and water instead of brine. They are tasty and hopefully freeze well. Very good stuff here, thank you. Smart! Thanks for sharing your subs! I’m trying to use what I have instead of buying more flours ^^ would another flour sub well? Like chickpea flour? Thank you! Hmm, not sure. Let us know if you give it a try! This is the first time I am gawking at cookies and I am loving it. I need to get myself cookies for my green tea. I love your auto computation thingy! Its very helpful to non baker audience!! Whoop! That’s a new feature we’re loving, too. No, almond meal is ground raw almonds, and almond FLOUR is blanched peeled almonds, so it yields a lighter, fluffier “flour-like” texture. would chia seeds work as part of the seed mixture? These turned out fantastic! Followed the recipe exactly. It’s hard not to eat all of them in one sitting. This was my first time cooking with aquafaba and I feel like a rock star that it worked!! Thanks for all the wonderful recipes. These look divine! Will be putting the recipe on my to-bake list for this summer! My husband can not have the aquafaba( chickpea allergies), what can I use instead? The only thing I can suggest without testing would probably be whipped egg whites because they are the same consistency as aquafaba. Otherwise I’m not sure! Sorry. If you try something let us know how it goes! If you aren’t concerned with the color changes, you could use black bean brine. It’ll make the cookies darker, but if your husband has an allergy that is limited to chickpeas, that would work. Thanks for the information.These cookies looks delicious! I am going to make it. I will look other recipes and try them. Could chia seeds be added or would take mess things up since they expand in liquids? Hmm, it may. If you try it let us know how it goes! Just made these! Absolutely yummy ?. I didn’t have a can of chickpeas so I substituted 1 egg. I baked for 17 minutes (my oven is new & it tends to cook things faster). I could have cooked for about 2 minutes less, but still very delicious. I will keep this recipe & make them again! These cookies are delicious! I love that the outside is a bit crispy and the inside is soft and chewy. I ended up adding a couple tablespoons of almond flour and oats at the end because my batter was pretty wet. I will definitely be making these again. Thinking of using an egg next time because I’m not vegan. Thanks for the recipe, Dana! So good! I made a double batch yesterday and used a 1.5” scoop for smaller cookies. They are almost gone. Two thumbs up! Nothing like warm cookies on a rainy Sunday afternoon. I used monk fruit instead of coconut sugar and they are delicious. 302 calories for one cookie? How big are they? They look pretty small. I usually make cookies about 1 1/2 Tbsp big, but I wanted these to be more substantial so I scooped them at around 3 Tbsp for a more sizable cookie. But feel free to cut in half (and reduce cooking time slightly) if desired. Daughter has nut allergies, what type of replacement flour do you recommend? They definitely look yummy, going to make these this week! I don’t like aquafaba. Can I use something else? The only other thing I can think of is an egg white (if you eat eggs, that is). Whoop! Glad to hear that, Pooja! FYI I pour 4 and 2 Tbsp amounts of aquafaba (chickpea liquid) into silicone muffin liners and freeze. Then pop the frozen discs into a bag and defrost individual sizes as needed. The coconut and almond are pretty central in this recipe. But I suppose you could try subbing things like oats and other seed meals. Any chance these will work oil free? Or with a pumpkin/apple sauce sub? I would recommend trying either banana or applesauce. Let us know if you give it a try! 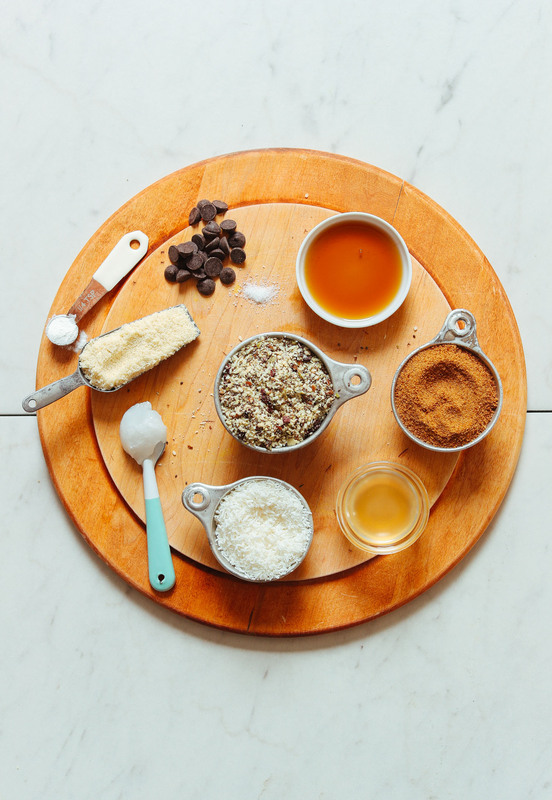 Did you use teff flakes and buckwheat flour in place of almond meal? I’m considering trying these without almonds but would be more inclined to take the risk if someone else tried this and succeeded! buonissimi! inoltre trovo molto utile la tabella nutrizionale alla fine dell’articolo. These look delicious! I’m definitely making them next weekend, but I’m sadly allergic to coconut. Is there anything I can use instead of the coconut? Just add more seeds and a different oil maybe? The oil can probably be subbed for any oil you like and brown sugar for the coconut sugar. I’m planning on using ground oats instead of the dessicated coconut myself. In place of coconut you could sub oats or another seed or nut meal! I use ground buckwheat, tigernut flour, teff flakes. Aquafaba – I am assuming you can get this at a grocery store. Any tips on where/with what I would find this item? I’ve always been intrigued by it so I’m super excited to try this! The easiest thing to do is buy any can of chickpeas at the store, crack it open, and use the liquid! We are not vegan (yet) but, these images make us what to take the challenge. We may have to start with the receipe. This looks delicious. Thanks for sharing. Just made these and they are fantastic. One question, I used an egg so I whipped the egg white and then mixed the egg yolk with the dry ingredients. Is that correct? Anyone know if I should have used the egg yolk? Agreed. If it worked out, great! Dana – this recipe has risen to the top of one of my all time favourites. This latest batch I didn’t have any aquafaba on hand and threw in two whole eggs instead. The finished cookies are still deliciously chewy and have kept their freshness and flavour well over 5 days in the fridge! Hi Dana. These cookies sound delicious and I can hardly wait to make them! Do you think that you could use a flax egg instead of the aquafaba? Hmm, I don’t think so, but I also haven’t tried. Let us know if you do! Hi! You could definitely use a flax egg, but I’ve found the aquafaba egg tends to keep the cookies chewier and they age better. Flax egg cookies are drier and go stale faster. Thank for the info Heather. I like chewy cookies so I will use the aquafaba or, as you suggest Dana, an egg white.